At 40, Mr. Rajiv Gandhi was the youngest Prime Minister of India, perhaps even one of the youngest elected heads of Government in the world. His mother, Smt. Indira Gandhi, was eight years older when she first became Prime Minister in 1966. His illustrious grandfather, Pt. Jawaharlal Nehru, was 58 when he started the long innings of 17 years as free India's first Prime Minister. As the harbinger of a generational change in the country, Shri Gandhi received the biggest mandate in the nation's history. He ordered elections to the Lok Sabha, the directly elected house of the Indian Parliament, as soon as mourning for his slain mother was over. In that election, the Congress, got a much higher proportion of the popular vote than in the preceding seven elections and captured a record 401 seats out of 508. Such an impressive start as the leader of 700 million Indians would have been remarkable under any circumstance. What makes it even more unique is that Shri Gandhi was a late and reluctant entrant into politics even though he belonged to an intensely political family that had served India for four generations - both during the freedom struggle and afterwards. 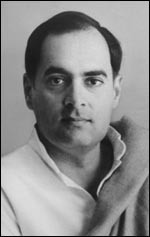 Shri Rajiv Gandhi was born on August 20, 1944, in Bombay. He was just three when India became independent and his grandfather became Prime Minister. His parents moved to New Delhi from Lucknow. His father, Feroze Gandhi, became an M.P., and earned a reputation as a fearless and hard-working Parliamentarian. Rajiv Gandhi spent his early childhood with his grandfather in the Teen Murti House, where Indira Gandhi served as the Prime Minister's hostess. He briefly went to school at Welham Prep in Dehra Dun but soon moved to the residential Doon School in the Himalayan foothills. There he made many lifelong friendships and was also joined by his younger brother, Sanjay. After leaving school, Shri Gandhi went to Trinity College, Cambridge, but soon shifted to the Imperial College (London). He did a course in mechanical engineering. He really was not interested in 'mugging for his exams', as went on to admit later. It was clear that politics did not interest him as a career. According to his classmates, his bookshelves were lined with volumes on science and engineering, not works on philosophy, politics or history. Music, however, had a pride of place in his interests. He liked Western and Hindustani classical, as well as modern music. Other interests included photography and amateur radio. His greatest passion, however, was flying. No wonder then, that on returning home from England, he passed the entrance examination to the Delhi Flying Club, and went to the obtain a commercial pilot's licence. Soon, he became a pilot with Indian Airlines, the domestic national carrier. While at Cambridge, he had met Sonia Maino, an Italian who was studying English. They were married in New Delhi in 1968. They stayed in Smt. Indira Gandhi's residence in New Delhi with their two children, Rahul and Priyanka. Theirs was a very private life despite the surrounding din and bustle of political activity. But his brother Sanjay's death in an air crash in 1980 changed that. Pressures on Shri Gandhi to enter politics and help his mother, then besieged by many internal and external challenges, grew. He resisted these pressures at first, but later bowed to their logic. He won the by-election to the Parliament, caused by his brother's death, from Amethi in U.P. In November 1982, when India hosted the Asian Games, the commitment made years earlier to build the stadia and other infrastructure was fulfilled. Shri Gandhi was entrusted with the task of getting all the work completed on time and ensuring that the games themselves were conducted without any hitches or flaws. In fulfilling this challenging task, he first displayed his flair for quiet efficiency and smooth coordination. At the same time, as General Secretary of the Congress, he started streamlining and energising the party organisation with equal diligence. All these qualities came to the fore later in far more testing and trying times. For no one could have ascended to power - becoming both Prime Minister and Congress President - in more tragic and tormenting circumstances than Shri Gandhi did in the wake of his mother's brutal assassination on 31 October, 1984. But he bore the awesome burden of personal grief and national responsibility with remarkable poise, dignity and restraint. During the month long election campaign, Shri Gandhi travelled tirelessly from one part of the country to the other, covering a distance equal to one and a half times the earth's circumference, speaking at 250 meetings in as many places and meeting millions face to face. A modern-minded, decisive but undemonstrative man, Shri Gandhi was at home in the world of high technology. And, as he repeatedly said, one of his main objectives, besides preserving India's unity, was to propel it into the twenty-first century.